A five-minute look at the Mother Base multiplayer in Metal Gear Solid V: The Phantom Pain has been revealed, demonstrating how Snake will sneak into other players' bases and steal their dudes. Most of this video has been floating around for a week or so now, but things get interesting at the 17:00 mark. The original trailer ends with a simple "thank you for watching," but IGN's updated video , released today, shifts to a segment of multiplayer action in which Snake skulks around another player's base, bypasses security systems and makes off a bunch of stuff—and a couple of guys, too. 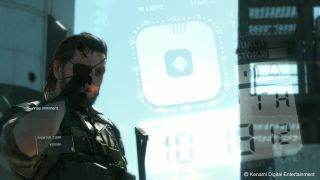 The trailer touches on how players will be able to upgrade bases with the addition of gun cameras, laser sensors and UAVs, and also demonstrates how the "phantom cigar" can be used to accelerate time. There's a bit of a Blood Dragon air to the whole thing, minus the knowing irony, but I'm hopeful it'll work out despite some of the inherently silly bits. And as IGN notes, the ability of players to interact with one another suggests that other, more directly PvP multiplayer modes could be on the way as well. Metal Gear Solid V: The Phantom Pain, according to this tweet from MGS mastermind Hideo Kojima, will be out near the end of 2014.